It's 7:30pm on a Monday night, and I've arrived far too early at the Empty Bottle. Besides me, the only people here are the bartender, a young couple engaged in giggling conversation over their beers, and the evening's entertainment: Lee Bains III and the Glory Fires, Pujol, and Chicago's own Flesh Panthers, who are sound checking. "It'll start picking up around doors, which is at 8:30 or 9," the bartender assures me as I solitarily sip on a Revolution Rosa. Of course, she turns out to be right. It's a Free Monday, after all. This is the Bottle's weekly time to shine in the vibrant Chicago live music scene. 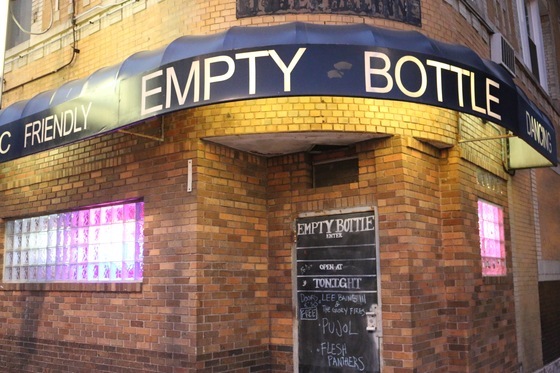 From the outside, the Empty Bottle looks like an ordinary music-friendly neighborhood bar, hugging the corner of Western and Cortez in Ukrainian Village. The only real deviation from the norm lies in the chalkboard door, which serves as the venue's marquee. Seeing the bands written out like specialty coffees helps lend the Bottle its characteristic highly informal, hole-in-the-wall feel. 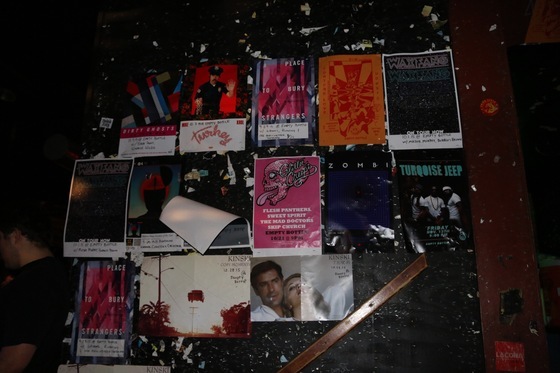 "It's a pretty weird place with all the crap on the walls, and it has that dive bar/punk club vibe that certain people tend to gravitate towards," says Mike Gebel, the venue's head of promotions. Despite its lo-fi visual trappings, though, the Bottle has outstanding acoustic qualities. The roomy stage is backed into a corner instead of placed against one wall, which allows concertgoers to fill in both the large bar area and the elevated table space that extend outward in an L shape. Everyone has a view, and even though it gets loud, the mix is consistently pristine. 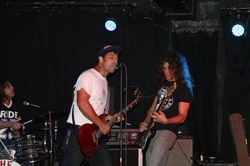 "It sounds good, that's always good and encouraging when you're a band," says Blake Williamson, the Glory Fires' drummer. "We usually run into these places that sound terrible, where it's really hard to get your vibe going." Acoustics are acoustics, but what really makes a venue special is the crowd it attracts. And since the Empty Bottle began Free Mondays in 2003, it has built a reputation for packing the house full of dedicated music lovers--people who can rock out to any band. The lack of a cover charge has provided, then and now, an added incentive for them to come to the show. "Free Mondays started as an opportunity for fans to get exposed to new music without having to pay a cover or buy tickets in advance," Gebel said. "They could come here on a Monday and see something new, something they've maybe never heard of, without having to worry about spending too much money." Everyone benefits from the arrangement. The crowd gets in for free. The bands get to play in front of a bigger crowd than they otherwise would have. And the Empty Bottle still sells plenty of drinks while reaffirming the "music friendly" reputation it advertises on its awning. Over the past 12 years, the Bottle has welcomed both Chicago-based and national acts on Free Mondays. Bartender Erin Page picks out Peoria metal band Minsk's performance as the best one she's seen on the job. "That was a really great show," she says. "We were at capacity  almost that night." 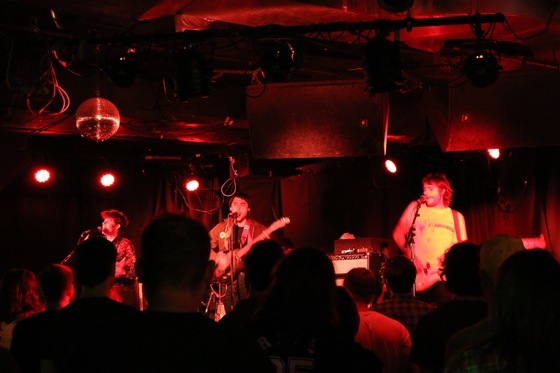 Gebel, meanwhile, picks local outfit Radar Eyes' record release show from February 2012 as an example of the music community's dedication to the concert series, which has grown mostly by word of mouth. "It can be hard to get a lot of people out in the dead of winter, when they might prefer to hole up in their warm apartments," he remarks, "so that kind of response from the community was awesome to see and the bands were excellent." Tonight's bands live up to that quality marker. Flesh Panthers come on first, introducing themselves as "the band from down the street" (they actually do practice down the street from the Bottle), and they launch into a blistering set of punk rock. The crowd has already grown to well over a hundred, and people are getting physically and vocally involved in the music as usual. 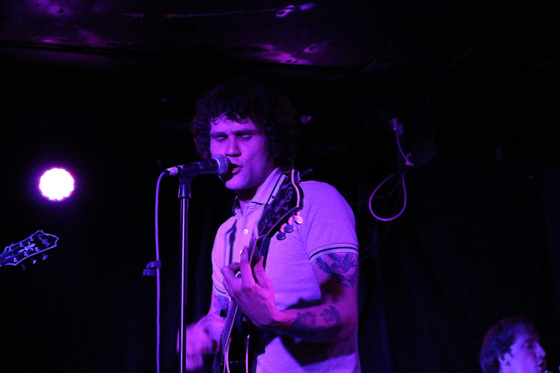 "Mondays are great," frontman Ryan Zombotron tells me after the show. "It's like a hootenanny, everyone's shouting out. That's what I want." His band is followed by Pujol, a four-piece group out of Nashville's growing underground garage scene. Their music is even more caustic than Flesh Panthers', their lead guitarist tearing through a train of solos with his curly mop of hair jittering about, yet it's got poppy enough melodies to be accessible to a wide audience. I'm standing in the elevated part of the Bottle, drinking up their performance--I think they've got something special--but also keeping an eye on what appears to be a hora-like dance developing in the most intense section of the floor. This just rolls off the backs of the regulars. "The Bottle has an 'anything goes' vibe," says Gebel. Finally, Lee Bains III and the Glory Fires take the stage and rejuvenate the slightly thinned-out crowd (people do have work the next day, and it's getting late). This is their third time playing the Empty Bottle, and though they've loved every occasion and it's their favorite venue in the city, they're visibly excited at the Free Monday atmosphere. "We were told that Mondays are the night, so we're amped for that," says Williamson. Bains is accordingly a madman on stage, belting out songs in his Southern howl as he stands on the bass drum and strolls through the audience with his guitar, avoiding the miniature mosh pit that has formed. The band delivers a tight set of hard-nosed Dixie-flavored rock music, carrying all the rowdy souls off into the alcohol-infused hazy bliss of the night. I end up leaving well past midnight, as the Empty Bottle keeps its doors open after the show and remains a hub of warm, engaging conversation and libation. Free Monday has lived up to its billing as one of the Chicago music scene's must-attend weekly events. It's headbanging guitaristry returned to its humble house show roots, but with the high fidelity production of a sparkling modern venue. It's everything you could want out of the beginning of a miserable work week. And did I mention that it's free? 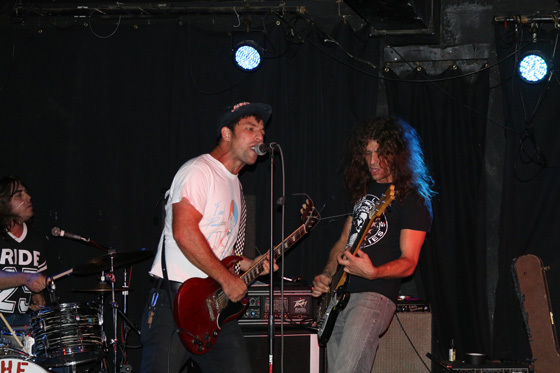 The next Empty Bottle Free Monday, on Oct. 5, will feature Turn to Crime, E G O and Deadbeat.